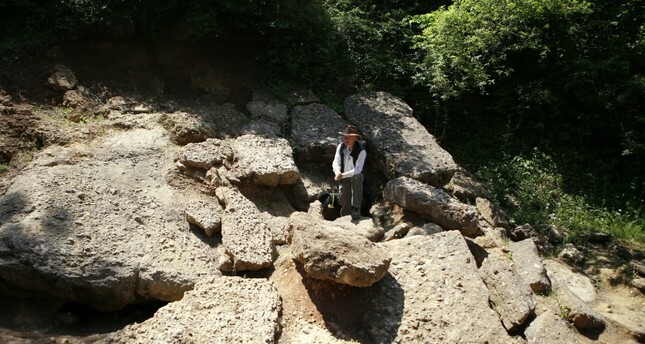 Archaeologist Semir Osmanagic is working hard to unveil the Bosnian Pyramids to the world. Claimed by archaeologist Semir Osmanagic, known as "the Bosnian Indiana Jones," the Bosnian Pyramids attract tens of thousands of tourists to Visoko city where they located on. While discussions on the Bosnian Pyramids are still on the world agenda, adventurers and history enthusiasts from all around the world visit Visoko to see the pyramids that were explored in 2005. Nearly 500,000 tourists from far-reaching countries like Australia, New Zealand, India and China visit the pyramids each year, greatly surpassing the 41,000 inhabitants of Visoko. Believing that the biggest pyramid, called "The Sun Pyramid," emits energy, many people visit the pyramid and pass time in the tube under the pyramid for healing and meditation. Meanwhile, the explorer of the pyramids, Semir Osmanagic, who is known as "The Bosnian Indiana Jones" with his cowboy hat, different style and his dog "Sunny" always next to him, attracts a great deal of attention as the tour guide. While the pyramids still keep the mystery behind them, volunteers who believe in the pyramids that come to Visoko for excavations are trying to unveil them. With the cooperation of the Bosnian Sun Pyramid Association and Osmanagic, funds provided for the excavation work in the area and the pyramids are trying to be promoted via advertisements prepared for volunteers and tourists. Speaking to Anadolu Agency (AA), Osmanagic said more than 2,000 volunteers from 62 countries came to Visoko in the last 7 years and helped the excavation work by unveiling the pyramids and opening tubes. Osmanagic also marked that thanks to the association, saying nearly 50,000 tourists visit the pyramids every year. Stressing that neither the state nor the municipality have helped the excavation work since the exploration of the pyramids, Osmanagic said, "Tourists are really interested in the pyramids. They want to visit here again and again." Implying that there is a concentrated energy at the Sun Pyramid, Osmanagic marked that tourists prefer the area for meditation and relaxing spiritually. The Bosnian Indiana Jones cited that they cleared a 800-meter (2,625-foot) route in the tubes under the Sun Pyramid with the aim of bounding them to the other tubes claiming that all the other pyramids are bound to each other. Bosnian Indiana Jones with his cowboy hat, is the golden boy of the tourists. As a result of the excavations conducted in 2005, it is seen that the pyramids were constructed by humans. Geometric blocks in rectangular, triangular and various forms were excavated under the pyramids. Osmanagic and his excavation explored the artificial concrete between the layers of the pyramids and detected that the organic fossilized plants within the layers correspond to 20,000 years ago with carbon measurement. Research conducted by 120 experts on archaeology, geology, pedology, geophysics and energy show that the Bosnian Pyramids are artifactual rather than natural. Reiterating that the European Archaeology Association (EEA) warns experts interested in the pyramids about not to visit the area, Osmanagic said, "The ones who are worried about the expected changes in history are trying to reject the existence of these pyramids." Marking that the Sun Pyramid in Bosnia is 220 meters high, while the biggest pyramid in Egypt is 147 meters, Osmanagic claimed that the content of history books must be changed. According to the Bosnian Indiana Jones, the scientists rejecting the Bosnian Pyramids have never visit the area and have only looked at the analysis and test results on the pyramids. Coming to Visoko from New Zealand to see the pyramids, Mollie Duey said, "I received several invitation from my friends all around the world and so I decided to visit the Bosnian Pyramids. Here what I see is nothing but pyramids. There are also scientific proof about them. It will not be wise to reject these structures." Adding that she is planning to visit the area one more time in three years, Duey is curious about the ongoing excavations and is waiting for what will be excavated under the pyramids. A Visoko citizen, Azra Ferhatovic also said the pyramids boost tourism in the area and added that it will be wise to make touristic investments in the city so that tourists planning to go back to Sarajevo just after visiting the pyramids may stay longer in Visoko.